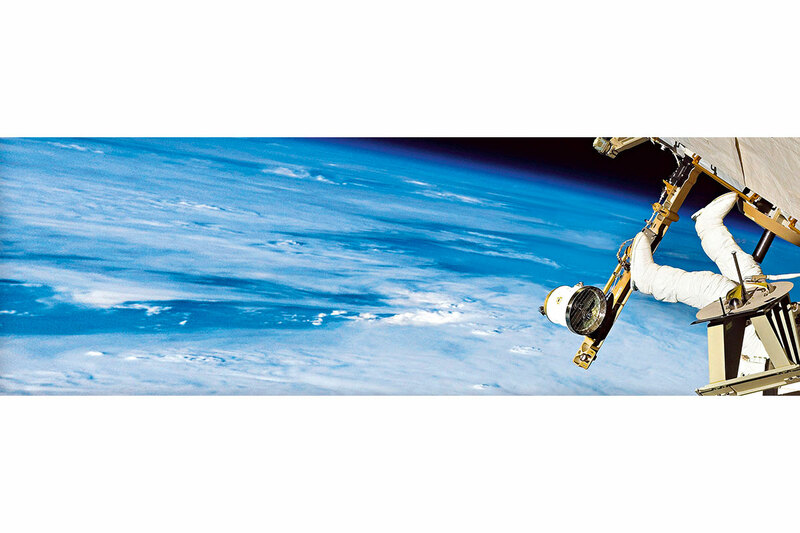 The figure of an astronaut is foregrounded as repoussoir for optimal depth of field, beneath him appears the curvature of the blue planet, veiled by clouds. 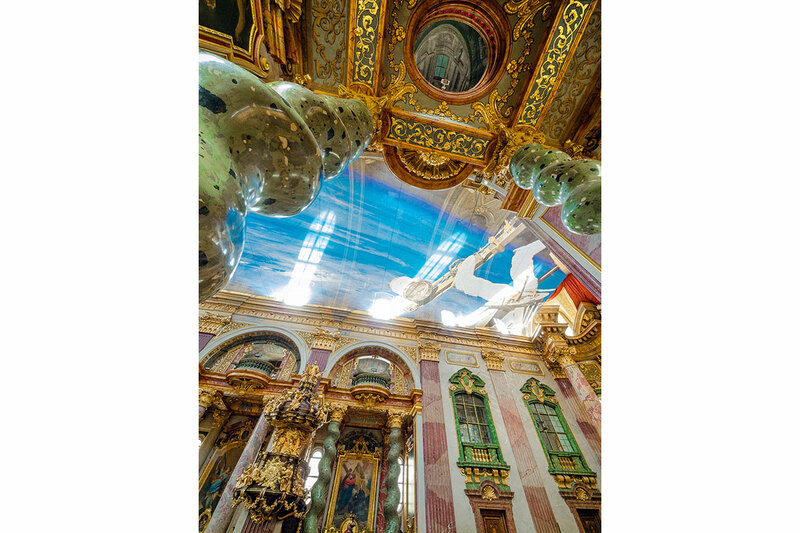 Golden risalites of Baroque origin provide the framing for the view from outer space, temporarily installed in front of a ceiling fresco at the Jesuit Church in Vienna from November, 28, till May, 25, 2009. 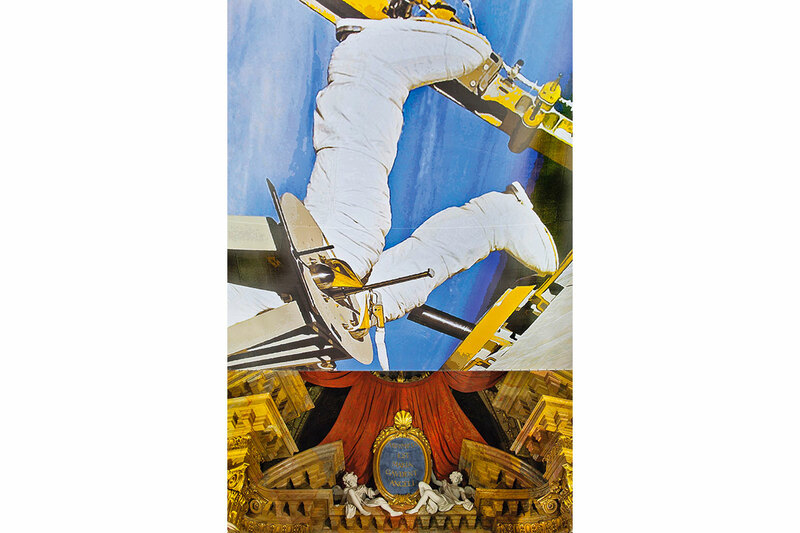 The covering of the sacral tunnel vault by the artist-collective Steinbrener/Dempf & Huber refers to the idea of „a distant view on Earth“, in reminiscence to Ignatius of Loyola, the founding father of the Jesuit order. 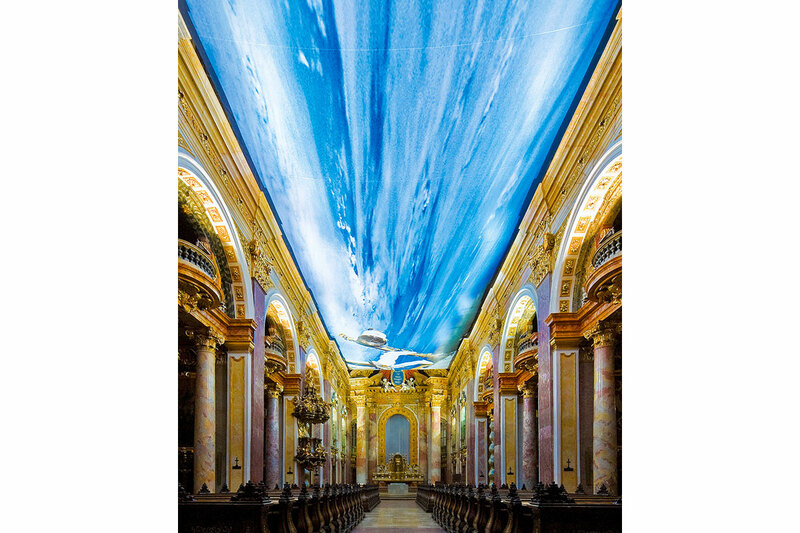 Printed on semi-transparent net fabric – which has recently become a favored material for promotionally effective covering of buildings and building areas –, the large print promises a rapture of the deep with a certain drop height between heaven and earth, similar to the vantage point Loyola ascribed to the three divine personae. 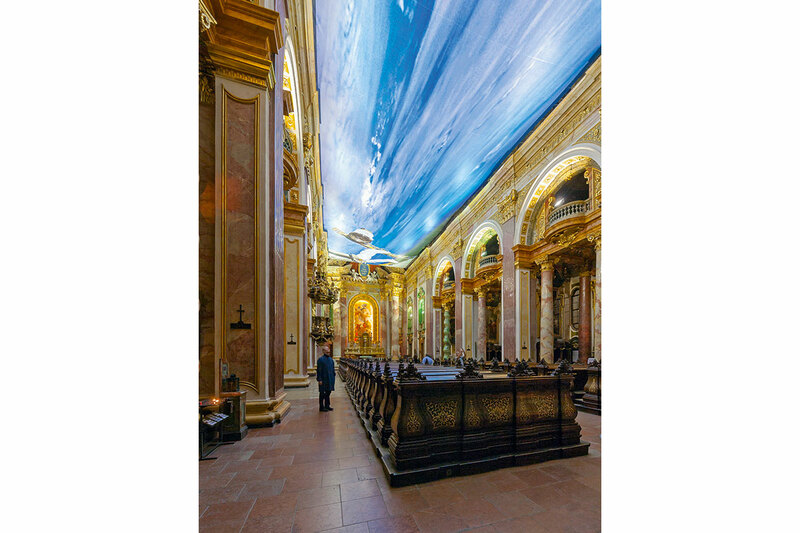 The ceiling frescoes by Andrea Pozzo, otherwise invoking spatial illusionism, putti and heavenly infinity, are now subjected to a “reverted view”, which encounters space technology and terrestrial blue-and-white. 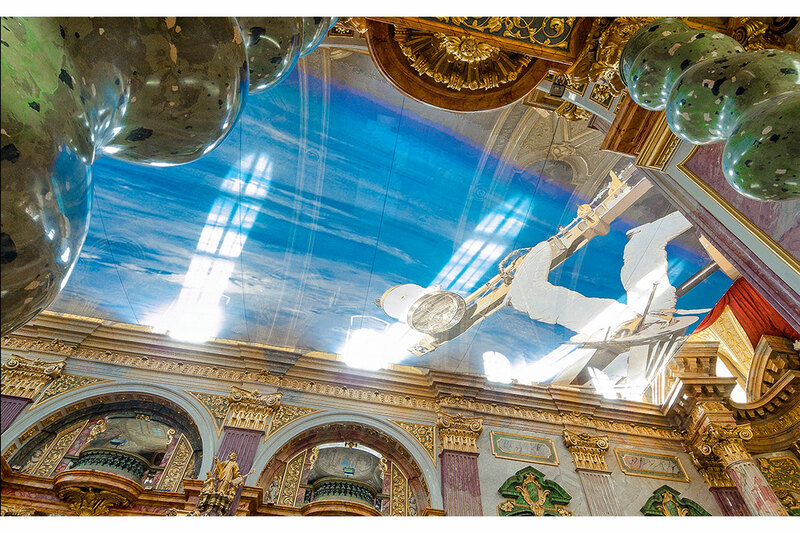 The relocation from nave to spaceship is induced by special lightning engineering, which allows the fresco vault, visible by daylight, to vanish after sunset behind the “Jesuits’ cosmos”. 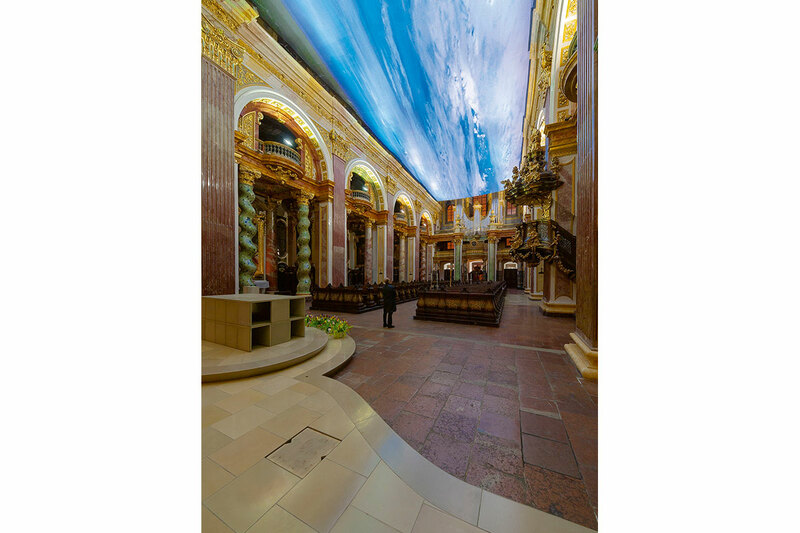 300 years after Pozzo’s death, Steinbrener/Dempf & Huber attempt to achieve by use of advertisement techniques what the painter once accomplished by use of trompe l’œil, the art of generating a three-dimensional effect on two-dimensional surfaces: the illusionistic dissolve of the sanctuary, of the boundaries between interior and exterior spaces. On closer inspection, Pozzo allows deliberately for an unmasking of the illusion in the service of faith, and Steinbrener/Dempf & Huber likewise are playfully exploring conceptions of illusion and reality. The calculated realness of the deception sharpens the eye and directs Loyola’s distant view on Earth – towards oneself.